We had a storm last night (6/26/2015) and the neighbors Oak tree, in their front yard, fell and damaged the front of their house. 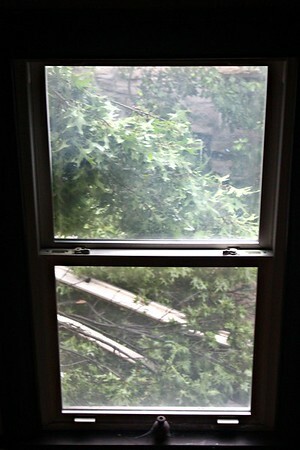 Part of the tree landed on our house, but we won't know the extent of the damage until they remove the tree. View out the window on the landing. We should have been able to see the neighbors driveway.